Asparagus is so loved in Germany it is nicknamed "Königsgemüse (King's Vegetable)," "Frühlingswonne (Springtime Delight)," and "Zartes Elfenbein (Soft Ivory)". The asparagus season begins in April and runs through June. During this time, asparagus dishes are on the menu at many restaurants and homes in Germany. The asparagus plant is a perennial that develops multiple edible shoots which are harvested in Spring as asparagus. Asparagus consists of 95% water and is very low in calorie: 1 pound has only 70 calories. It is also rich in potassium, folic acid, and vitamins C, B1, and B2. Asparagus is grown throughout Germany, in almost every state. They were introduced to Germany in the 16th century when they were first cultivated close to Stuttgart. Until the 18th century, they were considered a luxury food and only eaten by the wealthy. In the 19th century, the asparagus industry was expanded with more widespread cultivation throughout Germany. As a result, the industry has grown to handle the demand for asparagus both within Germany and in other countries. White asparagus are those that haven't yet broken the surface of the ground and haven't yet been touched by sunlight. They are harvested when the tips of the asparagus plants just start to lift the dirt on the ground's surface. They remain white because they are not yet exposed to sunlight. 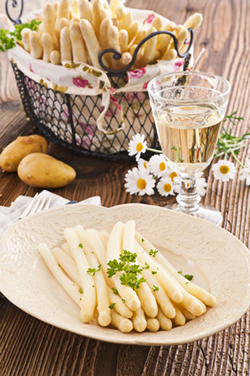 White asparagus are particularly mild in taste and are a favorite of Germans. Green asparagus are allowed to break the surface of the ground and grow several inches tall. They become green through the exposure to sunlight. These are a different variety of asparagus than white asparagus. Their stem is thinner and they are more flavorful. Unlike the white asparagus, only the bottom third of the stem needs to be peeled. Peel White Asparagus: White asparagus has a tough outer layer. This layer must be peeled before cooking. The best way to peel the asparagus is to use a potato peeler. Peel the asparagus from tip to end. The thicker the outer layer, the more needs to be peeled away. Once done with peeling, cut about 1/4 inch of the bottom end off. No Aluminum Pot: Asparagus can be cooked lying down in a large pot or standing up in a special "asparagus pot." Either way the pot should not be made out of aluminum because minerals in the asparagus react to the aluminum-oxide and turns the asparagus gray. Use only Minimal Water: Asparagus should be cooked in minimal water - just enough to cover the stems. If using a special "asparagus pot," cover only about 3/4ths of the asparagus with water, allowing the tips to cook from steam. This helps keep the vitamins and minerals in tact. Cook in Salt Water: Asparagus should be cooked in salt water. As a guideline, add 1/2 teaspoon for every quart (4 cups) of water. Add the salt to the water before adding the asparagus. Add Butter to the Water: Vegetables should always be cooked with a little fat, like oil or butter. Since butter goes well with asparagus, add 1 teaspoon butter to the water in which the asparagus are cooked in. Add Sugar to Reduce Bitterness: Sugar helps to minimize the bitter taste of asparagus, especially the green ones which tend to be more bitter. To reduce the bitter taste, add a pinch of sugar to the water in which the asparagus are cooked in. Add Lemon Juice for White Asparagus: Lemon juice can be used with white asparagus to prevent discoloration. Add lemon juice to the water in which the white asparagus are cooked in. However, lemon juice should not be used for green asparagus because it actually causes discoloration, turning the asparagus gray. Don't Overcook: Asparagus that have been overcooked are mushy and have lost their vitamins. Cook white asparagus between 15 - 20 minutes, depending on thickness, in boiling water (with salt, sugar, and butter). Cook green asparagus the same way 8 - 15 minutes. To test for doneness, poke the stem with a fork. The stem should be soft but still give a little resistance. Steaming Asparagus: An alternative way to cook asparagus is to steam them. The asparagus turn out very well and vitamins and minerals are not destroyed. Steam the asparagus for 20-30 minutes. The freshest asparagus taste the best. Use the following test to check for freshness when buying asparagus. 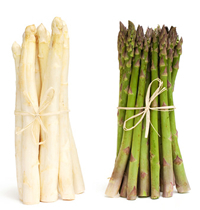 · The ends of the asparagus should not be hollow, dried out, or brown. The ends should appear moist. · If possible, squeeze the end of the asparagus. If the asparagus releases juice, then it is still fresh. · The asparagus should be firm and should not bend easily.